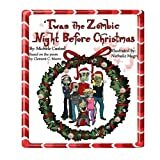 A twisted, yet kid-friendly, take on the traditional Christmas poem by Clement Clarke Moore, Twas the Zombie Night Before Christmas invites you into the life of the Rancid Family who is trying to survive AFTER the zombie apocalypse.The entertaining and down-right funny take on how zombies deal with Christmas is only heightened by the delightful illustrations that will have both children and parents laughing uncontrollably. This will be your new Christmas classic to be read year after year. A twisted, yet kid-friendly, take on the traditional Christmas poem by Clement Clarke Moore, Twas the Zombie Night Before Christmas invites you into the life of the Rancid Family who is trying to survive AFTER the zombie apocalypse. The entertaining and down-right funny take on how zombies deal with Christmas is only heightened by the delightful illustrations that will have both children and parents laughing uncontrollably. This will be your new Christmas classic to be read year after year.